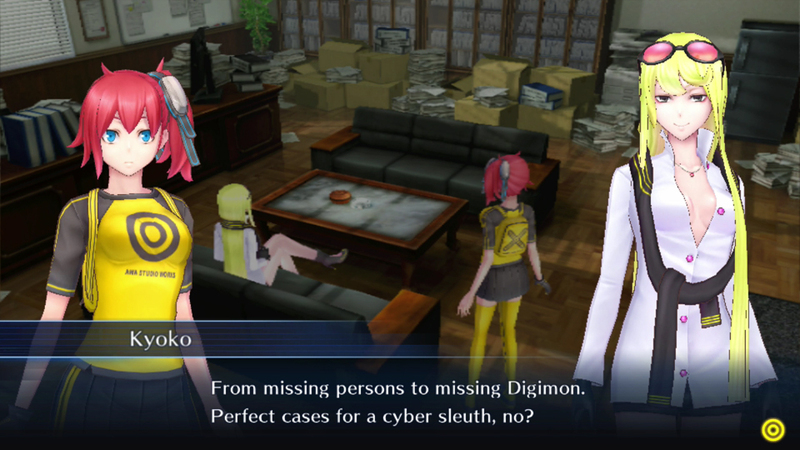 Digimon Story Cyber Sleuth, developed by Media.Vision for the PlayStation Vita, was first released in Japan in March 2015. Just about a year later, the Western release adds a PlayStation 4 version with improved textures and fidelity, but comparable performance. All caps from this review are from the Vita version. In a setting mostly reminiscent of the present day, one addition acts as the backbone of the story – EDEN, a virtual reality network interface that allows people to digitally enter the Internet and interact in otherwise impossible ways. 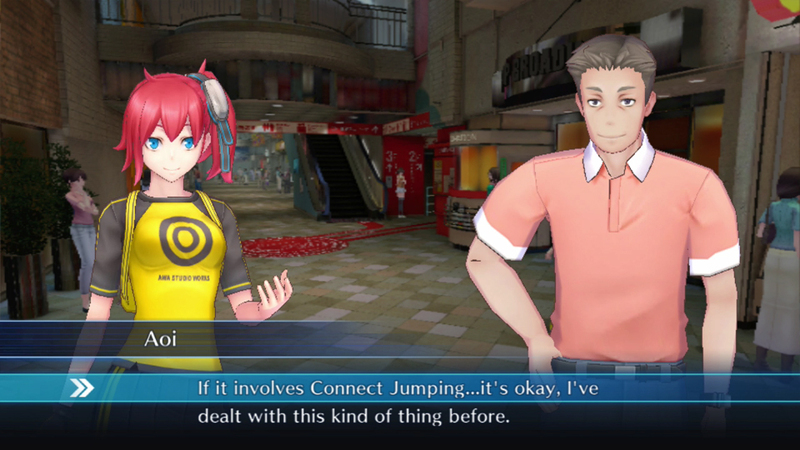 After being attacked by an aberrant enemy in EDEN, the protagonist’s unique situation gets her involved in working as a “cyber sleuth.” While solving cases in the real world and digital world, many involved with hackers and their Digimon, she becomes aware of a deeper secret of the network and its developers. There’s a male protagonist option as well, but I’ll come back to that detail in a bit. Altogether, the story is just okay. Large chunks of the first half can feel disjointed or entirely irrelevant, but everything picks up at the midway point. While the first half spends a lot of time meandering before getting to the point, the second half has a clearer direction and far more interesting events. The ending itself is disappointingly lackluster for a few reasons – most importantly, the absolute final boss fight feels completely forced. While character motivations up until that point seemed to make sense, the final battle reduced everything to “We think this ‘enemy’ is crazy, so even if they’re right we’re going to completely ignore what they’re saying and defeat them!” Where they could have taken an approach that dealt with the thematic elements of the finale, they instead took the most boring route. The results and conclusion also had some issues, but I did really like the post credits scene, even if it’s the type of thing that’s been done countless times before. Besides the mayonnaise. 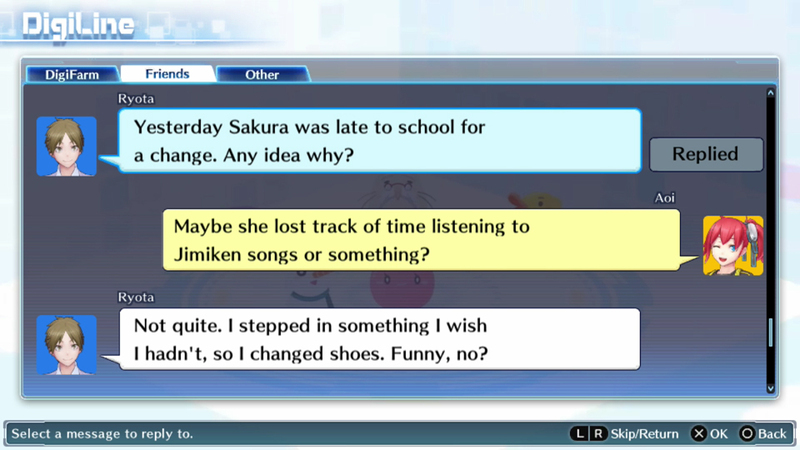 The characters offer a lot to the game, particularly Nokia, Kyoko, and Omnimon. Nokia’s “think first, do later” attitude and resulting interactions are some of the best lighthearted elements of the story. On the other end of the spectrum, Kyoko and Omnimon add a lot to the main story with a look at morals and different perspectives of the events and potential results. Yuuko is fine besides a few regressive instances, but there were plenty of points where I was just hoping someone would punch Arata in the face. For the main cast as a whole, one issue is unjustified self-loathing. They became involved in something completely out of their control and had no part in the results, yet continue to say that they were responsible for correcting the situation. The antagonists are thoroughly uninteresting, with only one semi-antagonist offering anything worth paying attention to. While the plot of the game is fine, a consistent issue is how events transition. Two characters may be talking and seem to be mid-conversation, then BAM, it’s over. In a few of these situations, they try to fill in the blanks after the fact, inadequately updating the player on what happened off-screen. It only makes things more confusing. While this type of thing happens a lot in the main story, many side-missions erratically jump around, failing to have any sense of coherency. Also, regarding side-missions, they’re frequently strange. One example is when a bunch of Digimon overwhelm a website’s server by repeatedly watching a boxing video. They get weirder. Among all this, one of the biggest issues for the game is the localization. Spelling, grammar, gender, and spacing errors, over-complicated or simply questionable translation, and even a few ZOMGs thrown in for whatever reason. It’s not as incomprehensible as something like Sword Art Online Hollow Fragment, but it is an inexcusable mess. Both of these games were also published by Bandai Namco, so it’s possible that they had the same localization company. Either way, let’s focus on the biggest problems with non-exclusive examples. First – grammar and spelling errors. Besides being too common, particularly in the form of run-on sentences, they make several conversations difficult to understand. Second – gender errors. 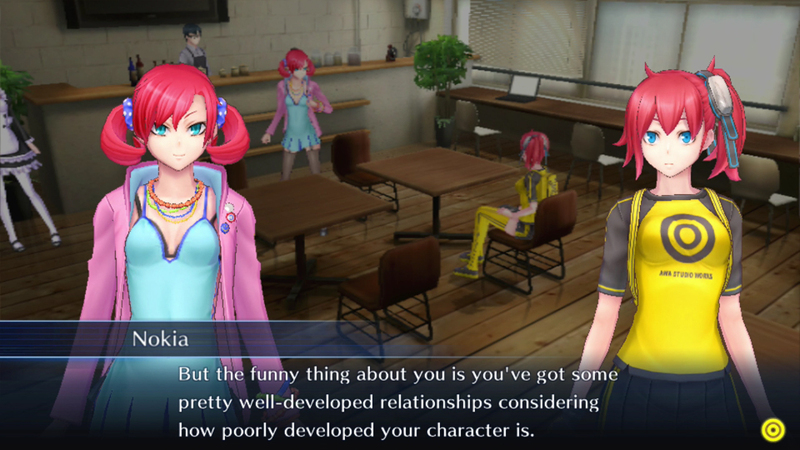 Regardless of whether you choose the male or female protagonist, they will be referred to as “he” or “him.” And before someone says, “There’s no gender neutral way to refer to them in English!”, see they/them (singular), or simply referring to them as “cyber sleuth.” Third – questionable translation. In at least one instance, “wao” (ワオ), which is just the Japanese pronunciation of the English word “wow,” was subtitled as “OMG.” Fourth – spacing errors. For a few dialogue choices the spacing is out of whack, and the sentences read like a continuous thought. It’s like the translator wasn’t aware that they were supposed to be distinct options. And if the game had QA, which seems unlikely, they somehow didn’t notice. Now let’s talk about the actual gameplay. And there is a lot to talk about. Each Digimon has three different classifications – its type, element, and rank. A favorable type matchup will result in dealing double damage while receiving half, although the opposite situation can easily be the case as well. A favorable element matchup, based on the element of the chosen attack and the selected target, will allow you to deal 50% extra damage, with the only downside being in the opposite position. Rank is one of eight general titles denoting the relative strength of the Digimon before accounting for things such as level. The battle system is a standard turn-based deal. 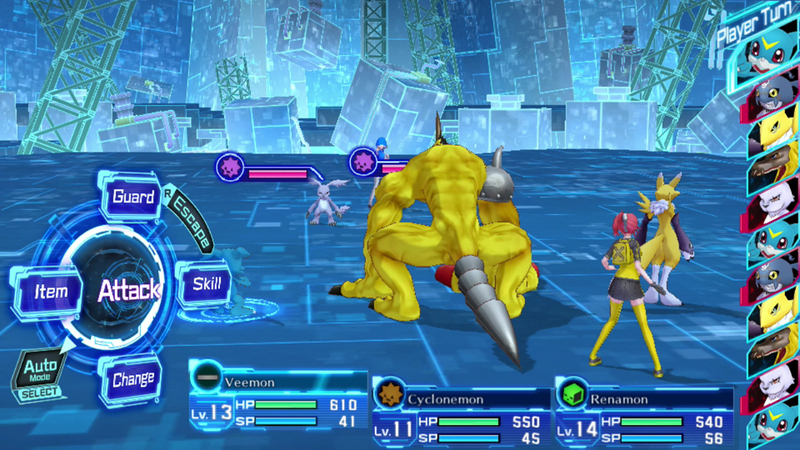 The player is able to pit up to three Digimon (from a party of up to eleven) against three enemies. The turn order is displayed on the right, and you can choose to use a basic attack, defend, use a skill, use an item, or swap for different party members. The only somewhat unique element is the combo system, which practically only helps to wedge in some extra damage. There are a lot of problems with the battle system, more becoming apparent as you progress. I’ll focus on one example and the general difficulty balance. Picture this – for a battle you have an ally’s two guest Digimon on your side, and they have infinite health. The enemy gets three turns for every one Digimon on your side, and it has high defense and HP. It alternates between buffing, and then attacking with a move that is inevitably a one-hit knockout. In my case, it took out all of my Digimon but one, then spammed the attack on the invincible guests twenty-seven times. Meanwhile, my last party member was flailing at it for measly damage. This is not that battle. Before I rip that apart, let’s take a look at the difficulty options and difficulty balance. At any time, you can swap between Normal and Hard difficulty levels from the main menu. For the most part, Normal is obscenely easy, and Hard provides a moderate challenge. The problem for both lies in boss battles. 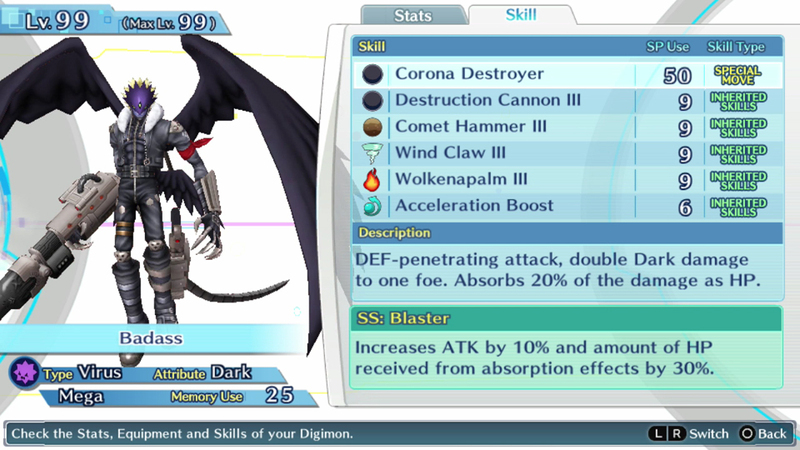 Boss enemies have arbitrarily high stats, even when the player would be allowed nothing comparable with those exact Digimon. Because bosses have such broken stats, many can only be reasonably defeated with “penetrating” attacks, which only certain Digimon have. Then, add in that many bosses can heal, and it can render a battle impossible after only a few turns. But because the enemy AI is terrible, it’s often quicker to reset the game than sit around waiting for them to kill you. So, back to that example battle. If that was the intentional design for the fight – the enemy spamming the guests after you’re down to one Digimon – why give the enemy such high health so that everything is painfully dragged out? If that wasn’t the intentional design, it was hideously balanced relative to everything before it, and it highlighted the godawful enemy AI. In general, it feels like enemies act completely randomly, never prioritizing weaker Digimon on your side, never exploiting weaknesses, and often buffing or healing when it makes no sense to do so. Last I checked, it’s 2016, and a dice roll doesn’t qualify as a substitute for proper AI. And in battles towards the end of the game, “normal” damage skills do so little damage relative to the penetrating attacks that it seems like the developers viewed those as a necessity. While the difficulty starts out based around team typing and luck, by the end those hardly matter as much as whether or not you’re decked out with penetrating attacks. Secondary elements hardly even matter, even though it would be better with them and typing swapping positions in damage calculation. And none of this even touches the gimmicky fights for several side missions. Logical difficulty balancing is nonexistent in this game, regardless of what difficulty level you choose. Next are out-of-battle mechanics. Most Digimon can digivolve into one of several higher-ranked Digimon, with certain requirements for each. This can be a level, stat at a certain number, or something else, and for the most part it ends up being a combination of things. You also have the option to de-digivolve to a lower rank, which increases the Digimon’s level cap and lets you swap over to a different evolution path. Some of these require a bit of grinding to meet the requirements, but it’s generally straightforward. The Field Guide lets you check what stats each Digimon will have at what level, so that allows you to plan ahead. To some extent, stats can also be manipulated via the Digifarm, which alternatively provides the chance to find side-missions or develop items. Then there’s the Digiline system. It’s pointless, broken, repetitive, and stupid. At many points, characters will send you messages about things, but it’s never important, and how you respond is irrelevant. Many of these “conversations” don’t make any sense, as the initial message and counter-response are on entirely different topics. More frequently, you receive messages from Digimon you’ve left in the Digifarm. These range from bits of corny bonding to quiz questions. However, you get the same messages so many times during the game that it just feels like a nuisance. Beyond the gameplay, the aesthetics are solid. The voice-acting is good, with Kyoko and Nokia standing out as the best. Kyoko is composed, determined, and sometimes hinting at madness, whereas Nokia is an oddball. She’s too energetic, reacts in unusual ways, and she makes some weird noises. It’s all appropriate for her character though. What is and is not voiced is a bit inconsistent, with some voices popping in randomly mid-conversation. A recent patch was made to address problems along these lines, but I’m not going to replay the game just to confirm that it’s been taken care of. The music is also very good, but with a few hindrances. There are several times in the detective agency or Nakano where there is dead silence for no apparent reason. Then, in the second half of the game, you hear a certain boss battle theme about fifteen times, which quickly dulls its impact. And the final battle leads off with the half-step bit from the Jaws theme, so it’s impossible to take that seriously. Visually, the game is also pretty good. The stylization of EDEN and other digital locations provides a stark contrast to the real world. Characters and environments also have a good degree of detail to them, even if a bunch of Digimon are just palette swaps. The main female characters are all QTs too, so that’s good. For battles and exploration, performance is consistently good – the only time I saw a substantial drop was a scripted battle with multiple guests and enemies. While I’ve obviously spent a lot of this review criticizing the numerous problems in the game, it has overall just barely been a positive experience. 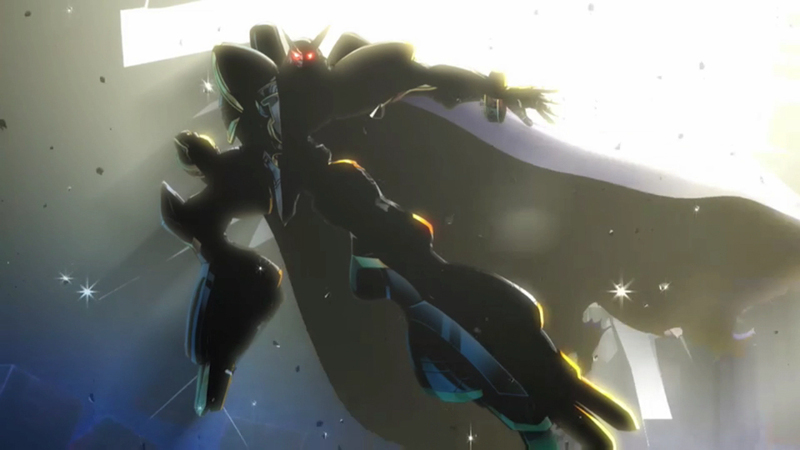 The story is nothing special, succeeding with moments more than the greater picture – in particular, Omnimon and Alphamon’s entrances are probably the best parts of the entire game. The conclusion is disappointing for many reasons, such as an extremely easy fight and problematic finale. The characters are mostly appealing, but don’t offer much beyond the surface. Gameplay is a bloated mess, with battle balance absolutely nonexistent and a single practical way to approach most of the more challenging battles. Constantly working towards a better team did feel rewarding, seeing the party continue to change and be shaped into the most efficient result I could manage. The audio and visuals are very good with only occasional drawbacks. Rather than being mixed, my opinions on individual elements mostly stand at polar opposites. Even then, despite the inconsistency, I’d say this was worth playing. 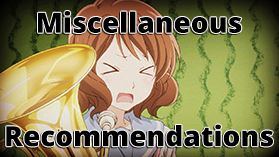 Recommendation – If you don’t like turn-based combat or long games, skip it. Either way, wait for a price drop before considering it. Also, be sure to take into account that the Vita version is download-only. Random note – I would complain about Omegamon’s name being changed to Omnimon, or Yggdrasil to “King Drasil,” but those localization options aren’t unique to this game. They’re still dumb though. Being a veteran on the field of long turn-based JRPGs I’ll keep your warnings in mind when picking this up.Also I have an obvious reason for wanting this game. Oh, and what reason would that be? So far I have played for around ten hours and am enjoyed the game more than you did. I agree that the Digiline is a pointless feature, which regularly interrupts you with Navi levels of useless messages. 10 hours in, I was definitely enjoying it. I’d say things started to turn sour a quarter or so through.